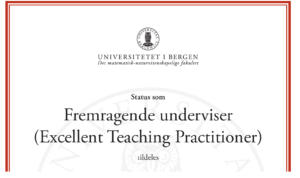 As the first Norwegian institution the University of Bergen rewards excellence in teaching practice through the newly established merit system Excellent Teaching Practitioner and Pedagogical Academy. Five university teachers at the Faculty of Mathematics and Natural Sciences will be awarded status as Excellent Teaching Practitioner in a ceremony in the University Aula 1st of June. The five Excellent Teaching Practitioners will form the Faculty’s Pedagogical Academy. We congratulate Øyvind Fiksen, Henriette Linge, Stein Dankert Kolstø, Fredrik Manne and Bjørn Tore Hjertaker! A merit system to reward teachers with a scholarly and collegial approach to teaching and learning has been an important goal for bioCEED, and we are proud that the University of Bergen has now established such a system. You can read more (in Norwegian) here.